In Combat Mission: Fortress Italy starte ich die Kampagne Gela Offensive mit der Livorno Division. The Americans invaded at Gela yesterday. Today, we throw them back into the sea. Secure the Battlegroup’s startline for the attack against Gela no later than 0430hrs. 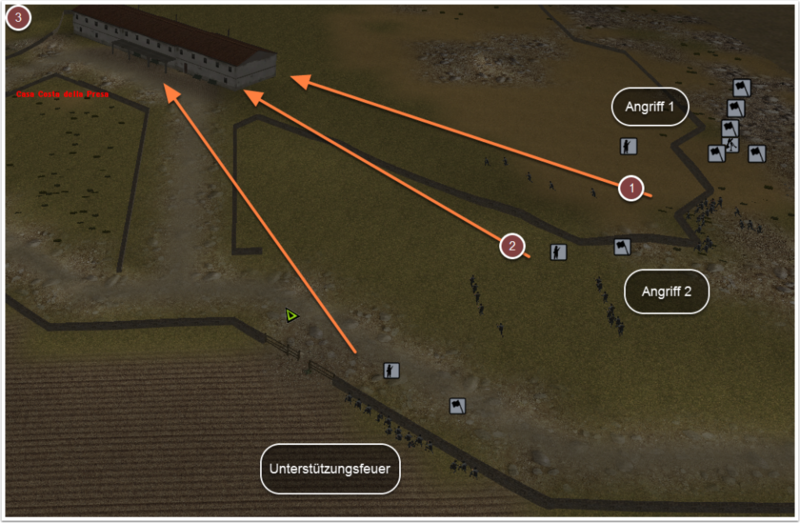 Two platoons of 3/34th Livorno Infantry Regiment have been tasked with reconnoitring a route to the battalion start line, securing the start line area, and establishing Observation Posts on dominating terrain. To maintain surprise for the attack no fire support is available. The US 26th Infantry Regiment was observed yesterday advancing north along Highway 117. It is not believed that they made it this far north in strength, however it is likely that they will have pushed patrols forward to screen their main positions. The enemy is likely to have established static listening posts combined with roving patrols covering this area, but not in strength. Move quickly to dominate any enemy you encounter. You must ensure that the startline and observation posts are secure in time for the rest of the battle group to move up and occupy. The remains of a defensive position lie just off Highway 117. It was shelled heavily by US ships during the landings yesterday, and the destroyed position is now deserted. However the minefields remain a threat to anyone moving through the area. 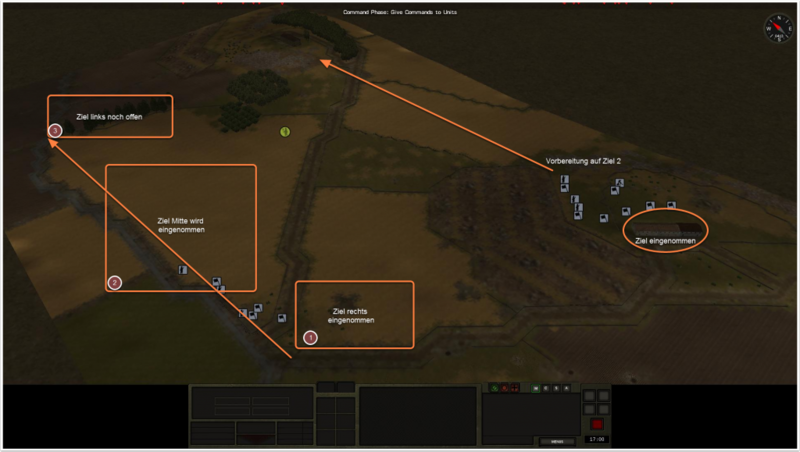 All the minefields are surrounded by barbed wire – avoid them if at all practical. Es handelt sich um eine reine Infanterieaktion zur Vorbereitung der eigentlichen Offensive. In einer nächtlichen Aktion werden die Starträume gesichert und vom Feind befreit. Dann die eigentliche Startlinie für die Bereitstellungsräume Links, Mitte und Rechts. Und noch die Villa auf dem Hügel von Beobachtern säubern. Das ganze habe ich als Video-AAR festgehalten. Viel Spaß.